Fremont, California, USA, July 27, 2010 - Patriot Memory, a global pioneer in high-performance memory, NAND flash and computer peripheral solutions, today announced the immediate availability of three new capacities to the award winning Inferno Series of SSDs. The Inferno 60GB, 120GB and 240GB drives build upon the earlier 100GB and 200GB product offerings found in the family. Designed around the SandForce SF-1200 SSD processor, the Inferno series delivers incredible performance while also providing superior reliability and longevity utilizing SandForce DuraClass™ technology. Inferno’s blazing performance of 285MB/s read and 275MB/s write (sequential) are more exceptional when the 24K IOPS (write) at 4K file sizes are considered. The result is a series of SSD optimized for enthusiast use as a primary system boot drive. Patriot Inferno SSDs are paired with specially screened MLC NAND Flash to deliver class leading performance, include a 2.5” to 3.5” adapter plate for easy installation into desktop computer chassis and are covered by a 3 year warranty. SandForce DuraClass™ technology provides enhanced endurance and reliability by an average of 20x over traditional SSD controllers through innovative write technology and Wear Leveling. 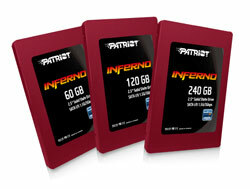 Check with your favorite distributor or reseller for the Patriot Inferno series SSD.